A one mile ocean swim that utilizes chip timing. The course is parallel to Sea Isle City's shore line. The traditional starting line will be located at approxiamtley 61st Street which means swimmers will swim north. If extreme currents run north to south on race day, the starting line will be switched to 27th Street in an effort to have participants swim with the current. Visit our website, www.sicbp.com, for more information. The race will be started at 11:00 AM, rain or shine. An electrical storm or dangerous surf conditions will necessitate resetting the start time until later in the day. If conditions do not improve, the swim will be cancelled. 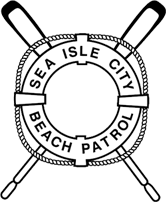 Race packet pick-up is on Saturday, July 20, between 9:00 AM and 10:30 AM at beach patrol headquarters, 10 44th Street.